The quality of this pillow is amazing. Colors are subdued and vivid at the same time. It is filled with a very sturdy substance which allows the pillow to maintain it's plush shape. I highly recommend this pillow. 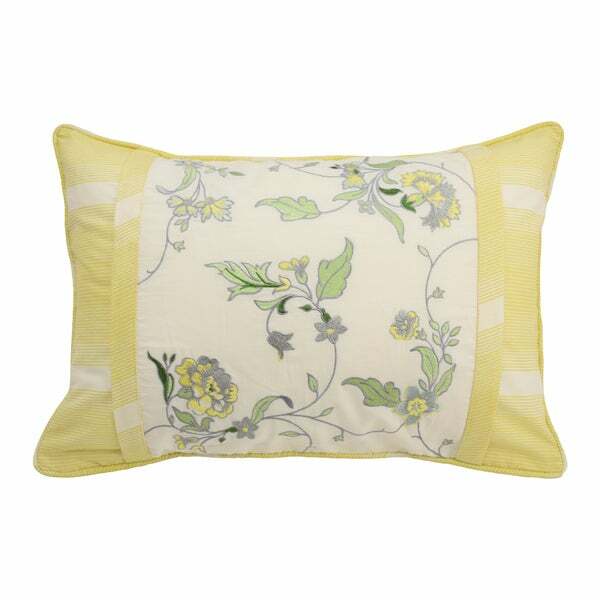 Brighten your bed with this pretty, floral-embroidered throw pillow. With a wide rectangular profile and cord edging, this plush pastel cushion is made from extra-soft pre-washed cotton over polyester fill for a soft, touchable finish. I recently ordered this pillow to coordinate with a new quilt set that I had ordered. The pillow is much more true to the colors that had shown on the page than the quilt set was. The design and some of the accent colors blend well with the quilt and add the touch of warmth to the room that I was trying to create. I had thought I would use it on the bed as a decorator pillow but it actually works well as an accent on the recliner in the room. The workmanship itself is lovely and the hand embroidery stitching is evident in its construction. It was carefully wrapped and came in a timely manner although about a week after the quilt had arrived. I would order a pillow from this company again even though I feel their items may be somewhat overpriced. With a more modest price Waverly could be my go-to company for bedding and accent pieces. Bought this to decorate my new bed in the master bedroom. Love it! Really brings out the soft yellow design in the comforter. Quite the focal point of the bed. This pillow co-ordinates with the quilt set I bought a week earlier! The quality is excellent and it finishes a great look for my master bedroom! I love this pillow. It is abundantly filled and it is exactly as pictured. Very well made and the embroidery work is excellent. This pillow added the right touch of white and yellow to my new bedroom. I could look for pillows all day. This one caught my eye but I wish I had waited to buy it. The fabric is too fancy and the decorative design would look better on another type of fabric. Very well made and great quality! Very pretty. Looks just like the photo. Happy with purchase. Beautiful pillow, very happy with it. To go with quilt set. It is bright, cheerful, and elegant all at once.